Hello, I have a lot of pictures to share from my recent visit. One of the places I absolutely had to visit when I was in Korea was the Namsan Tower/Seoul Tower. After watching one too many Korean dramas, this was a place I made a priority to visit. //embedr.flickr.com/assets/client-code.jsI ended up at the tower at night and it lights up in a green color. There wasn’t as many visitors as I expected since it was night time. The view of from that height was really beautiful but it was a bit dark and it would’ve been better during the day. On the lower level, there was a lot of wired “trees” that were actually filled with locks. The Namsan tower is a famous couple spot to hang locks to symbolize an everlasting love. It’s a bit cliche and cheesy but I just had to do it at least once. After I bought a lock (which included a marker for writing in your names) at the gift shop, I went up to the roof terrace area to find a place to lock it. I’m not sure if I mentioned this in other posts but I visited Korea with my boyfriend so I’m not just locking this lock by myself, which would be funny and awkward. The heart was a very commonly seen symbol at the tower area. There was a heart sculpture on display there, and a photo area with heart arches that’s decorated with lights (I didn’t get a good picture of these since there was a waiting line). And one last picture of the Namsan Tower before I left this Korean drama scene haha. Have you ever wanted to visit a place featured in a drama? Thee are loads of drama places that I want to visit… Did you visit any other drama filming locations? Wauw that’s awesome! Do you know what they were filming? Yayyyyy! 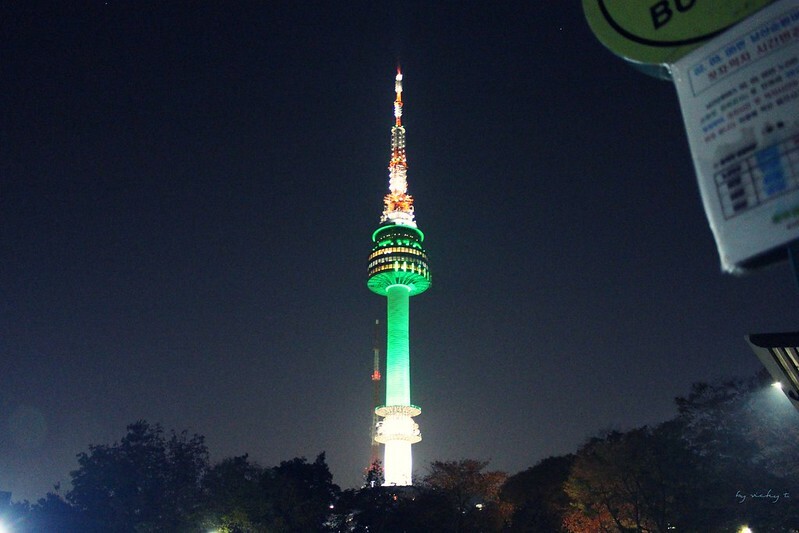 Namsan Tower! 😀 ❤ Hahaha it's like in every Korean drama ever written LOL! I’ve never seen love lock trees before! And the lock you had was just so cute! Thank you haha. This is my first time seeing the trees too but I think they had them to provide more space for people to place their locks. Unfortunately only in Seoul for two days working so did not get to visit Namsan Tower unfortunately but your great photos and post make me wish I did…thank you for a great post. Love your pictures of this place! It looks really romantic!